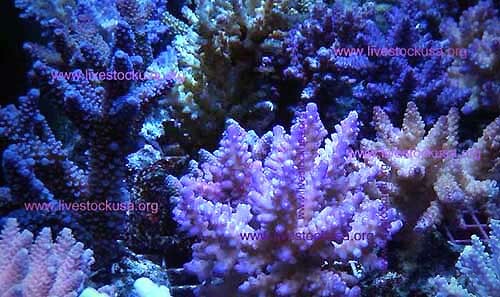 Acroporas are many reefkeepers&apos; favorites, and for good reason!! 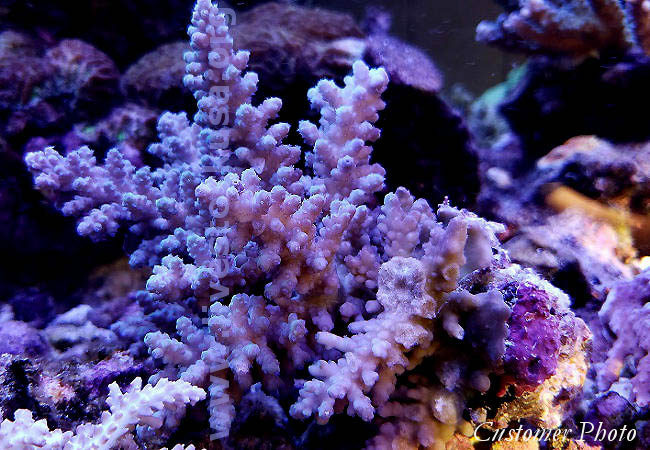 They are one of main "reef building" types of corals that so many picture in their minds when they think "corals." They are as diverse as they are beautiful, with at various times and sources, over a hundred species available to the hobbyist. However they are not recommended for "newbies." 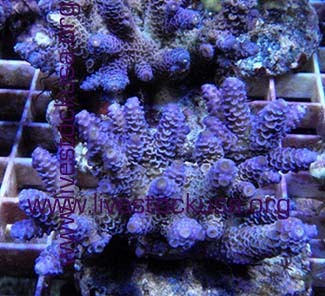 You should NOT "cut your teeth" on them ... learn corals with easier, less sensitive, less expensive types (such as leathers, mushrooms, polyps, LPS - large polyped stony - corals), and then, after gaining experience and understanding the husbandry required, graduate to Acroporas, and other SPS (small polyped stony) corals. We offer Acroporas in box lots (usually 10-12 to 20) direct from the overseas suppliers. We have only the highest quality animals from independent "old-timer" shippers who know their Acro shipping beyond your imagination. Our products are not the cheaper, commonly commercially available ones. They are 5-star Grade AAA pieces. There is a one box minimum - one box minimum (just one!) from *any single given site of origin* ... your order will be packed for you at the island of origin. The wild pieces run from golf ball (small) sized to hand ball, or tennis ball sized (medium), with some ranging to baseball to softball sized (large) ... aquaculture sizing typically runs smaller than wild sizing. Most aquaculture pieces are golf ball to hand ball, or tennis ball sized at best, the Java is called 3"+ colonies. Most Indonesia cultured sources are about that, some will be a little bit under, some will be over that. 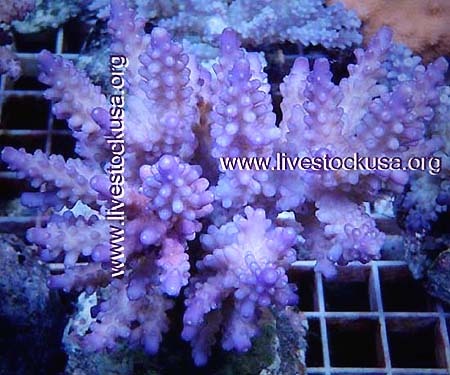 Note: Acropora shipments are not always a weekly thing, most sites are every two weeks at best. Sometimes due to weather or permits, there might only be one shipment in a month. The information below shows the place of origin, tells if wild or cultured, the approximate number of pieces in a box, if the box is "assorted only" or "by species" if the pieces can be selected from a list, then price per piece and box, the day of arrival to LAX, as well as the usual leadtime for ordering. If a source is shipping for Sunday at LAX, you can order by Wednesday and have a box of Acros the next Monday. Scheduling can fluctuate ... please check with us for availabilities! 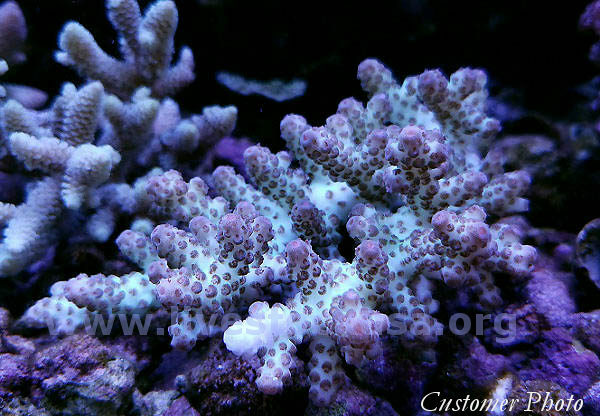 Thanks to the Chesapeake Marine Aquarium Society for this set of Australia Acros! Note: When ordering from sites that offer species lists, you may order assorted if you want. If you provide a list, your order may or may not exactly match your list for various reasons, such as there were no CITES permits that week for that type or they weren't looking good for shipping, or they were out. Usually, subs will be of a very similar appearing species, or another of something you did order. Often, the lists are filled almost exactly, but not always, and we can't completely control or guaranty the selection of every piece on any given week, order, or box. Actual quantities may vary slightly ... adjustments will be made after your shipment arrives. Prices above are FOB (freight on board) LAX. You pay domestic freight to your local airport from LAX. IF different sources arrive on different days and can't be joined, but you can order say Kupang and Bali the same day, as they both arrive at LAX on Sunday. The corals get to you the day after the "Arrival LAX" day. 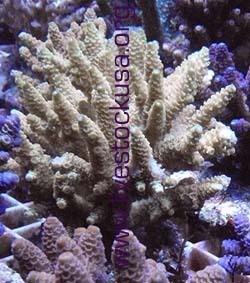 We have supplied these corals to wholesalers, stores, and the biggest farmers in the country. You will be very satisfied too. Most boxes will have at least a couple or a few pieces you will have never seen, or maybe saw in a picture once. Many customers say they have not ever seen pieces like these. Excellent health, great sizing, not to mention our superb customer service. We always recommend dipping if not running a quarantine tank. Their health is great. DOA's are near zero. 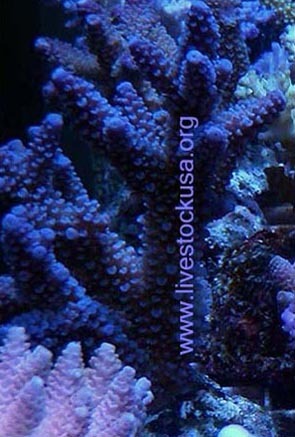 So, if you are thinking of doing some Acropora stocking or fragging, we assure you that you would be thrilled with any of the boxes above. 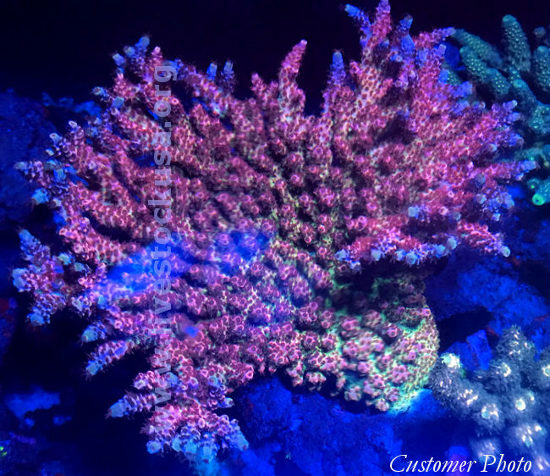 "... these are amazing colonies ... the only word I could say was "HOLY COW" ... the health and colors of these acros are so good and brilliant ..."
"Thanks for everything. Very nice and healthy pieces!" "Everything arrived safe and sound. Whomever packs these corals does a great job. 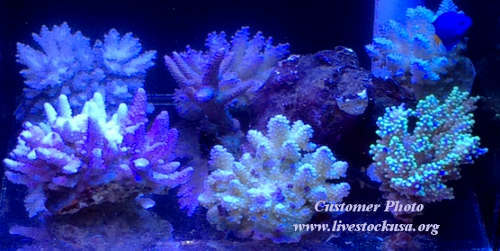 All 15 Acros are colorful and beautiful whole colonies. All arrived packed in plenty of fresh smelling water. They arrived at about 66 degrees F., which is not bad at all considering that they spent time in the belly of a plane. Thanks for your insight and great communication." You can see some of David's great Acro pictures scattered around this page! Fraggers who have purchased these have received a dozen-plus frags or more (immediately) per piece, from any of the wild origin sites. There are some pictures on the site here that can give an idea of the pieces you get. They are "World Class" or they wouldn't be here! 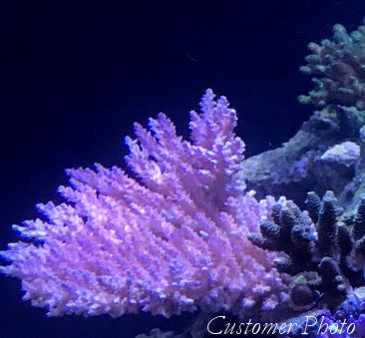 Here is a before and after photo of a Fiji Acropora sent to us from a customer. The first image (on the left) is from when it was first received. A nice pink Acro, seemingly nothing extraordinary. The larger photo is after six months or so ... note the blue tips on the new growth. Thanks to Jason for the pics! If you have questions don't hesitate to send an e-mail or call. With your order please send us an e-mail with your phone number ... and we'll need to know the name (city) of your nearest major airport. After ordering you will receive an order confirmation and upon shipment you will receive a shipping notification, which will include the estimated time of arrival for your shipment, as well as other details. 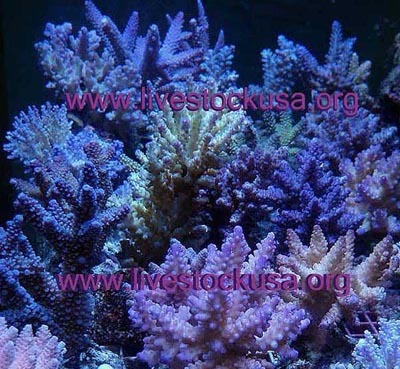 The average shipping cost for one box of corals (U.S. destinations only) is approx. $75-125, depending on the airline, and your location. Please note, orders cannot be accepted from southern California, unless there are flights there from LAX (no LA area orders, sorry). Also no orders can be taken from Hawai'i, Canada, or any international destinations ... thank you! 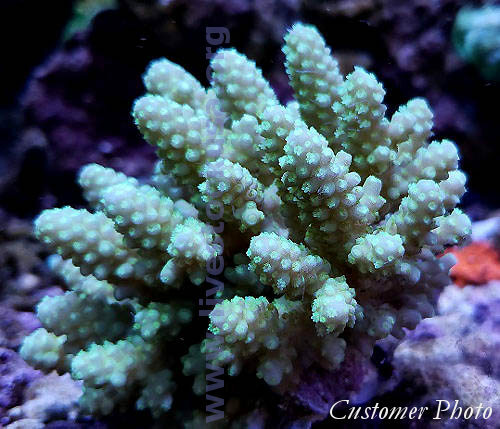 Fiji Acropora - Thanks to Francisco M. of Miami for the photo!